In the 14th century, disguised death crossed the European borders. With the name “Gersin’s Bacil”, it was carried by the children of the Golden Horde, the Tartars, who besieged the city of Kafa in the Black Sea. The Genoese merchant ships, following the trails of silk for years, sailed from the port of Kafa, bringing back to Sicily the first sick and dead of the black plague. Soon, one third of Europe will no longer exist. In 1438, Venice was inhabited by just 58000 poor souls – about as many as today, while 3 out of 4 are over the age of 60. Today’s death of Venice is not hidden in the fibers of torn, contaminated clothes, nor in dead bodies, Tartars and black rats. It hides in a totally modern, online short-term rental platform: Airbnb. The 58 thousand permanent residents of the floating city, also known as “Airbnb Land”, welcome an equal number of visitors every day. Funny thing is that, every day, the 58 thousand visitors are …different people. 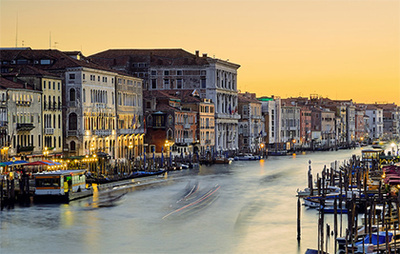 With their travel motives being the bucket lists, the things to do before the age of 40, the selfie sticks and the frenzied rhythms that force you to do as many things as possible the fastest you can, the single-day-tourists suffocate Venice and cause underwater upheavals. Nobody seem to really care about the city’s history, its culture and its people. The locals manage to get a normal breath only by dusk, when the hordes of travelers are gone. Night time is the only time – and only before the next dawn – that they can enjoy quietness, walk their dogs in the empty alleys, find an open local store if lucky, or walk under the shadows of the once glamorous and majestic buildings that now are dying along with the city as well. It is just then that Venetians see Venice as it really is: a ghost town, essentially inhospitable, maybe even hostile, altered and dysfunctional, beaten by chaotic, mass tourism. The younger ones are leaving as massively as the tourists are coming. Venice is sinking in her own waters but profit does not care the slightest. With 12000 euros per sq m purchase price, property owners refuse to renew rental contracts, forcing more people to move out. The once magnificent palaces of doctrines are not maintained for years, the central mail building is bought by Benetton, brokers sell buildings of dubious reliability to investors, cruise ships cause small earthquakes, the city’s foundations are daily eroded, the canals violently shaken by the numerous boats circulating among them, many elderly people are forced to rent rooms of their own homes to tourists because they cannot cope anymore with ever-increasing accuracy. Little Venetian is left in Venice. In twenty years is being said that there will be no native. Today’s gondoliers hardly know a few catchy phrases in Italian. The times where Hollywood studios visited Venice for the precious lessons of the old gondoliers for their shooting have long passed; while the famous Venetian masks and long dresses taste the musky breath and the sour sweat of customers who will rent them only for a few hours. All happens for the revival of the old, dead age. The once-ideal honeymoon destination is now the informal pan-European capital of day-to-day tourism through the famous online platform, degrading from over costing, serving only the interests of the tourism industry. Maybe the next time we talk about Venice will no longer exist.